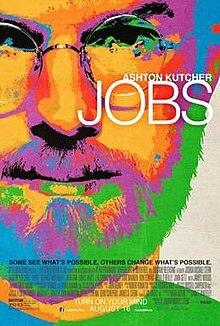 Ashton Kutcher plays Steve Jobs in this movie, which tells you about how Apple was created, and how Steve Jobs changed the world of technology. The film manages to deliver a message: You can do the impossible as long as you believe it, but if you don’t, you will not succeed. In other words, some people see what’s possible, other’s change what’s possible. Josh Gad hilariously plays Steve Wozniak, Jobs’ childhood friend, partner and co-founder of Apple. Dermot Mulroney plays Mike Markkula, who invested in Apple in 1976 and eventually started working there, while Matthew Modine plays John Sculley, the former CEO of Pepsi, who soon becomes the CEO of Apple and forces Jobs out of the company in 1985, and Luke Haas plays Daniel Kottke, Jobs’ friend. Ashton Kutcher is an amazing actor in this movie. In the first scene, which shows Jobs presenting the iPod at an Apple Town Hall meeting in 2001, for a second I thought it was the real Steve Jobs! After about an hour, the movie started to get a little boring, so I think older people would enjoy this movie more than I did. This film is filled with laughs and great acting, but I don’t think this movie is appropriate for kids under 14 because there is a lot of language. But if you are 14 and over, I think you would really enjoy this movie and laugh a lot from it. Also, here is the film’s site. I saw this movie with Zeev 2 days ago and we both didn’t enjoy it too much. Ashton Kutcher is an excellent actor. I agree with you this much. However, I think that it didn’t convey the facts in a clear way. Uncless you knew the story prior to the movie, you couldn’t really understand what was the revolution of the Apple PC all about (except the design!). Also, we got the feeling that, after 2 hours, they ran out of time, and just cut it short! What about the IPhone?! and the IPad?! In my eyes, these were the true greatest revolutions that changed the world of technology and, in the movie, they were totally ignored! and what about the fact that Steve Jobs had cancer and died at a young age? How can a movie that was produced after his death overlook it? On the other hand, some scenes were too long, too much talk and….. boring (just as you rightly observed).